Thursday evening and this is the last of the week’s CSA. Roasting green beans is one of my favorite preparations. The combination of olive oil, lemon juice, and garlic dressing and a hot oven leads to a lovely charring and really brings out the sweetness of the beans. We ate them warm, but they make a good cold dish as well. Finish them with some good balsamic vinegar from Ancient Olive. The whole onions, with the sweetness of the peppers, and a mild Italian sausage from Wholefoods all fried together are great way to use a surfeit of peppers. One pound of whole green beans, topped. Heat the oven to 450F. Line a baking tray with parchment paper. Wash the beans and place in a large bowl. Mix the other ingredients together and add to the beans. Toss until the beans are thoroughly covered. Spread thinly on the parchment paper and roast for 15-20 minutes or until nicely browned. Place in a suitable serving dish and dress with some good balsamic vinegar. Six small sweet peppers, halved with seeds and pith removed. Heat a suitable cast iron skillet with some olive oil. Add onions, when brown in parts, add the whole sausage. When brown, remove the sausage and cut into slices. Return to pan. Add peppers and salt and pepper. Reduce heat and cook covered until flavors blend and peppers are thoroughly soft and their skin charred. Transfer to a suitable serving dish and deglaze the skillet with red wine. Add wine sauce to the serving dish. Adjust seasoning. goes very well with a cheap and cheerful Primativo and a crusty loaf of bread. 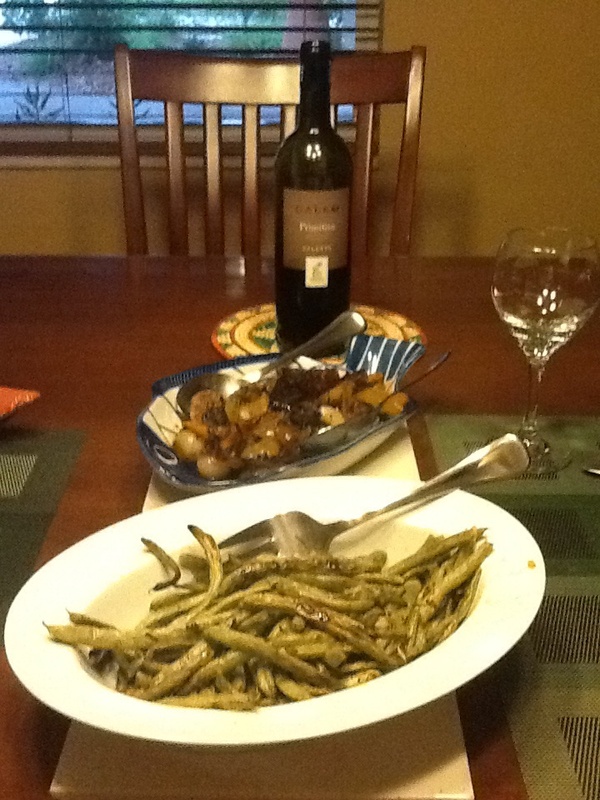 Front to back; roasted green beans, peppers and sausage, and a Primativo. This is a must read then.. Interesting comment from Ema. I am a little dubious though. Is she real, a bot, or is the blog produced in some blog sweatshop? The way the posts are written on the blog is strange and the information about her is vague.